The story of the Chilean miners who were trapped over 200 stories underground, and their subsequent rescue after a whopping 69 days, is one of humanity’s finest. It is a story of hope, courage, faith and determination, and it had ‘major motion picture’ written all over it. Unfortunately, the word ‘major’ proves to be the biggest problem with the eventual motion picture. 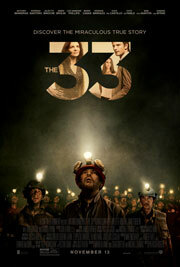 “The 33” had an intimate, claustrophobic film within its grasp, but chose to paint by numbers instead. They even recorded all of the dialogue in English. Ninety-nine percent of the characters are Chilean; this movie has no business being in English. On August 5, 2010, a group of men working for the San Jose Mining Company went to work in a mine in the Atacama Desert, despite concerns from staffers – and clear signs from the mine itself – that the mine was becoming unstable. While the men were in the mine, the rock shifted above them, cutting off their access to the surface. The men retreated to a shelter 2,300 feet below ground, where there was to be a radio, rations, medical supplies and a way out. The initial plan was to climb the escape ladders in the shelter, only to discover that their employers never finished building them. To add insult to injury, the radio was disconnected, and there were no medical supplies.